This 35-year-old Canadian seems to have started like most of us, in relative obscurity, being born in Yellowknife, Northwest Territories and growing up in Penticton, British Columbia. These are not necessarily hubs of artistic development in the country but then again, we all start somewhere. However the year 2000 was a watershed in Mr. Koyczan's career when he won first place in the National Poetry Slam in Providence, Rhode Island. For those not quite in the know, let's cover some terminology. (Remember that the word "slam" means to criticise.) A "poetry slam" is a competition where poets read or recite usually original work and are then judged on a numeric scale. The judges may be previously selected members of the audience or possibly somebody of literary importance depending on the formality of the contest. While the performance centers on the poetry, costumes, props and acting may enter into the presentation which makes it more performance art than just a simple recitation. The National Poetry Slam is the mother of all slams occurring every year in early August in a different U.S. city. Note that a "book slam" is the same idea but where the content is part of a book or a short story. In 2003, Koyczan formed a musical, spoken word trio called Tons of Fun University with fellow Canadian poet C. R. Avery and American poet Mike McGee which resulted in the 2005 album "The Them They're Talking About". Koyczan published a collection of poems in 2005 called Visiting Hours (Amazon) which ended up on the lists Best Books of 2005 in the newspapers The Guardian of Britain and Canada's The Globe and Mail. Canadian television documentary series Heart of a Poet featured Koyczan in a 2007 episode broadcast on Bravo! They write: Award-winning, spoken word sensation Shane Koyczan delivers his dynamic performance to a jam-packed house in Vancouver and proves his ranking as one of the top slam poets in the world. Koyczan is the winner of the U.S. National Poetry Slam, The Canadian Spoken Word Olympics, the CBC Poetry Face-Off, and author of ‘Visiting Hours’, published by Mother Press. I recently "ran across" a link to the following video. I had never heard of Shane Koyczan. I knew nothing of his work. However I discovered some things: slam poetry, recitation as performance art and Shane Koyczan. This man writes good words. He delivers them in a captivating manner. His presence on stage has a certain commanding quality as when he's there, you can't look away. I usually think of words as something I read. I had forgotten that words are also something I hear. I can read someone but I can also listen to someone and with the process of somebody actively presenting their words comes a different experience with a difference message or at least a different delivery of their message. Canadian poet Shane Koyczan performing at Book Slam, London's best night of words and music. Poetry slam. Book slam. The spoken word. Who knew? Or had I forgotten? Shane Koyczan is an award winning Canadian Poet, Author and Performer. 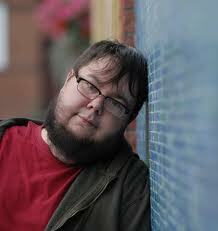 Shane L. Koyczan (born 22 May 1976) is a Canadian poet and writer. Born in Yellowknife, Northwest Territories, Koyczan grew up in Penticton, British Columbia. In 2000, he became the first Canadian to win the Individual Championship title at the US National Poetry Slam. Together with Mighty Mike McGee and C. R. Avery, he is the co-founder of spoken word, "talk rock" trio, Tons of Fun University (T.O.F.U.). In August 2007 Shane Koyczan and his work were the subject of an episode of the television documentary series Heart of a Poet, produced by Canadian filmmaker Maureen Judge for broadcaster Bravo!. The National Poetry Slam (NPS) is a performance poetry competition where teams from across the United States, Canada, and France participate in a large-scale poetry slam. The event occurs in early August every year and takes place in a different US city. A poetry slam is a competition at which poets read or recite original work (or, more rarely, that of others). These performances are then judged on a numeric scale by previously selected members of the audience. A spiral notebook with the name of a jr. or sr. high girl (usually) written on the top line. The books is passed around among classmates who write nasty things (slam) on the page under the girl's name. House of Parlance Media Inc.
House of Parlance is a new media company and trade book publisher inspired by literary and visual storytelling. We work with authors, writers, artists, illustrators and spoken word poets. From high-quality titles to electronic media, our works promote new connections between artists, authors, and their worldwide audiences. Visiting Hours is Shane’s incredibly well-received first collection, which was a Guardian and a Globe and Mail Best Book of the Year. Tons of Fun University is a musical, spoken word trio based in Vancouver, British Columbia, Canada, which formed in 2003. It consists of Canadian poets Shane Koyczan and C. R. Avery, and American poet Mighty Mike McGee. The first book of poetry published by internationally renowned spoken word performer, Shane Koyczan. Voted to *Best Books of 2005* lists in the Guardian (UK) and Globe and Mail newspapers. Almost one year ago to the day, Shane Koyczan confronted an audience of millions. Taking centre stage at the Opening Ceremonies for the 2010 Vancouver Olympics, the slam poet stood by his lonesome to deliver his ode to being Canadian, We Are More, during an event televised worldwide. The Opening Ceremony of the 2010 Winter Olympics was held on February 12, 2010 beginning at 6:00 pm PST at BC Place Stadium in Vancouver, British Columbia, Canada. Shane Koyczan performed slam poetry, a variation on his "We Are More". Performers formed a giant maple leaf around Koyczan with red flares to end off his section. Google video search: "Shane Koyczan"